The easiest way to try the features of Home Loan Manager Pro is to open the sample workbook and have a play with the example accounts. You can open the sample workbook at any time by selecting Open Sample Workbook from the File menu. The example accounts can be a useful reference when you set up your own loan information in the software, and the following section provides more information on each one of them. "Home Loan - Mrs A Citizen"
Example of a typical home loan. This loan is a 30-year principal and interest home loan, with variable interest rates, and a monthly account keeping fee. A payout plan has been set up to show what it would take to cut five years off the loan. Transactions are downloaded from the Internet once every six months and loaded into the software with the import transaction wizard. The automatching tool then instantly allocates all the categories. Tip - The samples directory contains a .csv file with the latest set of transactions for this account. As an exercise you may wish to (1) add the next statement for the account, and then (2) import the transactions. "Home Loan Redraw - Mrs A Citizen"
Example of a typical home loan with a redraw facility. This loan is a 30-year principal and interest home loan, with variable interest rates, and a monthly account keeping fee. The loan has a redraw facility, so all extra money deposited into the account reduces the amount of interest charged on the loan. So far the homeowner has made several additional repayments to the loan, from bonus overtime earned and a tax refund, and has also made one large withdrawal to help with house renovations. 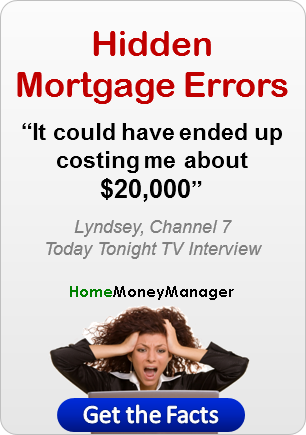 The homeowner has also set up a payout plan to help them cut 2 years off the loan, and is on track to save over $56,000 in interest charges if they manage to increase their repayments by and approximately $65 each month. "Interest Only Loan - Mr A Citizen"
Example of an investment property loan. This loan is a 20-year investment interest only loan with variable interest rates, and a monthly account keeping fee. The homeowner switched the loan in the first three months to remove the account keeping fee and to take advantage of a better interest rate. "Investment Loan - Miss A Citizen"
Example of a share trading or margin loan. This investment loan is a 20-year line of credit with no repayments, and variable interest rates. The homeowner negotiated a discount of 0.50% off the standard interest rate and all interest charges are being capitalised back into the balance. Each time a share parcel is purchased it is funded directly from the loan. "Line of Credit - Mrs A Citizen"
Example of a mortgage being set up as a line of credit, with all income and expenses going through the loan. This loan is a 30-year line of credit, with principal and interest repayments, and the ability to frequently deposit and withdraw money. The current borrowing limit is 200,000 and the bank charges a penalty rate on amounts over this limit. A discount of 0.10% off the standard rate was included as part of a credit card package. The homeowner deposits all salary and rental income directly into the loan. Day to day living expenses are being paid for with a credit card, which is paid off once a month via a direct transfer from the loan. Additional deposits and withdrawals are made as more money becomes available or is required. "Mortgage Offset - Mr & Mrs A Citizen"
Example of a mortgage linked to an offset account. This mortgage is a 30-year principal and interest home loan with variable interest rates. The homeowners were awarded a discount of 0.25% off the standard rate for being members of a professional association. In addition the account is linked to a 100% deductible offset account so that any additional funds can be placed in the account to reduce the monthly interest. A payout plan has been set up to keep them on track to cutting 15 years off their mortgage, and helping them save more than $450,000 in interest charges. For information on how this software will help you manage your loans, refer to the software overview help topic.